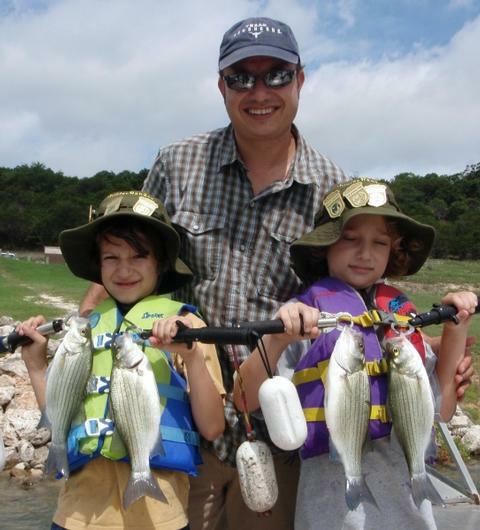 I fished with 6 year old Daniel L. and his mom, Anne S. of Harker Heights this morning. This Army family just moved to Ft. Hood from their previous duty station in the northeast, and has been “on the ground” for all of 6 days. Mom did some internet research on some fun mother-son things to do with the rest of their summertime and fishing and horseback riding both made the cut. So, with a single phone call on Tuesday, we coordinated this trip and today we made it happen! Daniel is a sharp, enthusiastic kid who learned quickly and listened closely, and he enjoyed success as a result. 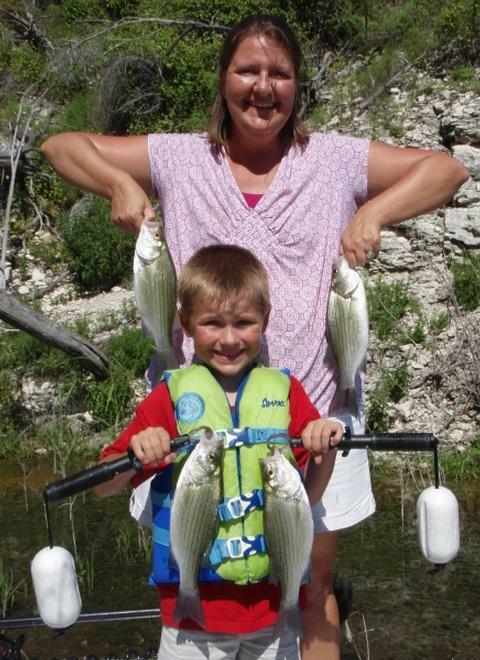 Here mom helps him show off 4 of his bigger fish landed today. Today we enjoyed hot, dry, high-pressure conditions, much the same as the conditions we had the last half of the day yesterday, and the same conditions that are forecast for the next several days. With such weather, the fish get into a predictable routine and that makes finding them a little simpler than is typical. We did two trips in one today, focusing on larger, deepwater white bass for the first part of the trip, then changing over to shallow water panfishing at the end of the trip. Daniel had never landed a fish before, so, we had our work cut out for us. We got “on station” shortly after sunrise, put lures in the water and in no time, Daniel was fast to his first fish of the trip and of his lifetime — a feat which earned him a Texas Parks and Wildlife First Fish Award!! We fished the white bass in 4 different areas for as long as the fishing held up, including Areas 040/041 (best action, early, boated 15 fish), Area 207/208 (found nothing), Area 458 (found juveniles fish only and left after boating 2), and Area 644/444 (moderate, waning action, 4 fish). All fish came on downriggers, which, by the end of the window, Daniel was setting on his own. Our last stop came at Area 231 where we fished for sunfish with slip floats and live bait. Daniel also did very well at this by placing his bait consistently in the productive areas I pointed out to him, and by setting the hook correctly once the float began to be moved by the sunfish. We boated 12 fish here before the novelty wore off, the sun got hot, and the winds got a bit light, letting mom and I know it was time to call it a very good day and head to the dock. 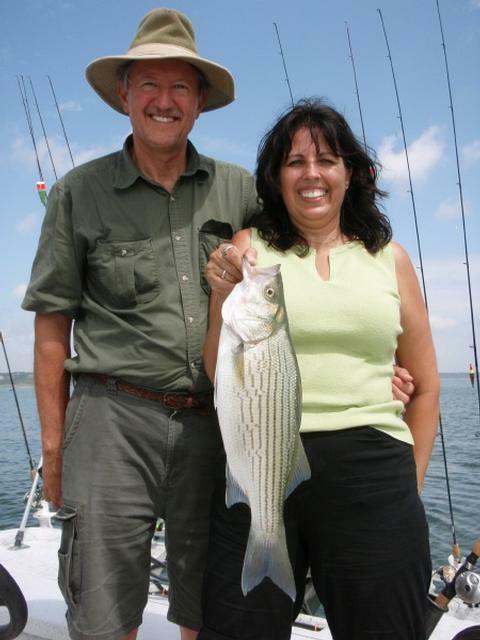 I fished a morning trip on Belton Lake today with returning guest Lyn B. from the Atlanta, GA, area, and her fishing buddy, Ruffin, also of the Atlanta area. The two were in town to celebrate Lyn’s mom’s 50th wedding anniversary. On our first trip in the late Spring 2 years ago, we fished Stillhouse and did well on largemouth and white bass by vertical jigging. Today, I chose Belton for variety’s sake to take a shot at some topwater action and hybrid striped bass. Lyn and Ruffin with 3 hybrid taken in a short, intense feed right around 11:30am today. As we got on the water we were blessed to find some very aggressive and long-lasting topwater action right off the bat. Between Areas 483 and 501, we found a mix of white bass and short hybrids working over juvenile shad big-time. Over a 45 minute span, my two guests worked the rods and I simply ran the trolling motor and took fish off the hook. During this frenzy, we boated 31 fish and had a few others pull off enroute to the boat. Many fish regurgitated very small shad ranging from 3/4 to 1 inch in length — this confirmed that the small presentation we were using on our Cork Rigs were just right. After this action died, the topwater was just about over for good for the morning, and we had to actually work for the remainder of our catch. In summary, we got 1 fish on topwater just NE of Area 651, out in open water from the cove mouth. This fish came on a Cicada and was in a very loose, well-dispersed school of fish on a waning topwater feed. Next, we moved to Area 562 and repeated the same scenario — 1 fish on a Cicada taken from a very loose, well-dispersed school of fish on a waning topwater feed. Next, we hit Area 174 and began using downriggers for the first time today. We boated 2 keeper hybrid here on Pets and moved on after the remaining fish got lockjaw. Then, it was on to Areas 472-473. We continued the downrigging program here and boated 6 fish — 5 whites and a short hybrid. On to Area 214 for more downrigging and 5 more white bass, plus a missed keeper hybrid. We ended the day with a short flurry of keeper hybrid activity found right on and NE of Area 181, again, on downriggers. As is common of feeding “spikes” at mid-day, this was very short-lived. It was now around noon, we’d boated exactly 60 fish, and my travel-weary companions were ready for a nap in the air conditioning, and a bit of lunch, so we called it a great morning at that point and headed back in. This evening I invited my mom, Charlotte, out to fish with me based on a strong hunch that the topwater we enjoyed this morning would return as the sun set. Mom’s fished with me for my whole life and we’ve never encountered topwater action while she’s been aboard, so I was really hoping this would be a first for her. My mom, Charlotte, with a nice 5.0 pound hybrid taken on downriggers just before tonight’s big topwater feed. We got on the water around 6:15 and did a little downrigging until the time was right around 8:00pm and the sun had set sufficiently to dim the lights enough for some topwater action to take place. During our time spent downrigging we boated 10 fish working large and small silver Pets “solo” behind the balls. This included 8 white bass, 1 short hybrid, and 1 keeper hybrid — a fish going right at 5 pounds which would turn out to be our only keeper hybrid on this evening’s outing. As is typical before a sunset frenzy, there was a bit of a lull for about an hour, from ~7pm to 8pm, then, suddenly, there was one splash, then 7 or 8, then 30 or 40, and soon the surface was frothing with surface feeding fish. We worked these fish over thoroughly, trying to make every cast count by ensuring they were well-placed, and correctly retrieved. We enjoyed nearly an hour of topwater action and boated exactly 60 fish during the melee. Not long after wrapping up I got a very relable report that fish were also active on topwater today and for the last 5 evenings at Area 012 around this same time. One note about topwater fishing for white bass (or any schooling fish prone to sounding at any time) — you’ve really got to “make hay while the sun shines”, and that includes having rods already set up with appropriate lures, making well placed casts to present your lure to multiple fish in a given cast, working your lure at a productive pace and not letting adrenaline cause your retrieve speed to increase. I see a lot of people lose a lot of valuable time by fooling around with fish they’ve landed. Unhooking fish can be made simpler by 1) using single hooks instead of treble hooks, and 2) pinching down the barbs with a pair of needle-nose pliers. This makes for a smoother, quicker, and less damaging release to get you back in the water that much more quickly. Finally, taking a look at the big picture and seeing if the fish are moving in a specific direction and then keeping up with them while remaining at a “safe” distance away to avoid spooking them will also up your catch. TALLY = 60 fish in the morning, 70 fish in the evening for a total of 130 fish boated today. Skies: 100% thin, grey, low clouds, clearing off my noon. I was joined this morning by News 8 Austin on-air personality Bonnie Gonzales and videographer Drew Moses. Our goal today was to obtain footage for Bonnie’s monthly News 8 Outdoors feature. We were in pursuit of white bass today using downriggers which is a staple presentation for me all throughout the summer months. Fortunately, the fish more than cooperated for us this morning. We looked over a bit of water with sonar and found both bait and gamefish and got the downriggers down in the midst of both. Today, our key depth was 25-26 feet. There was a very well defined thermocline set up today and the fish were just 2-3 feet above it. 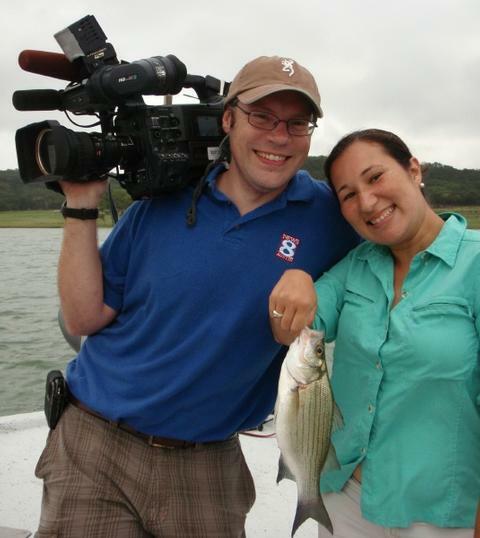 News 8 Bureau Chief Bonnie Gonzales and camera man Drew Moses pose for my camera with one of Bonnie’s white bass. 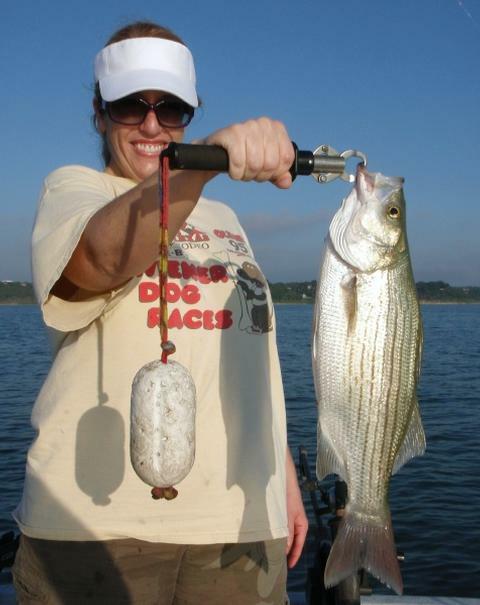 Bonnie had never landed a white bass before today’s outing and had never fished with downriggers before, but did quite well with just a little coaching. Bonnie was a good sport and a hands-on kind of person. She stripped the baits out behind the boat the proper distance, clipped the line into the release clips, lowered the balls to the correct depth, took all the slack out of the system and then kept an eye on sonar with me as we worked to stay on top of the fish and bait. Within minutes of putting two spreads out (in a 150 yard radius, 90 degree arc to the N and W of Area 644) we had a release — and as luck would have it, it was a double. I had two tandem rigs out; one was a 13 Pet / 13 Pet and the other was a 13 Pet / 12 Pet combo. The double hookup came on the 13/13 and consisted of a white bass striking the lead bait and a largemouth striking the trailer. We got to compare and contrast the two species on camera and then released them. We continued fishing as Bonnie continued with informal interview questions pertaining to the lures we were using, the habits of the fish, different fishing techniques used throughout the year, the makeup of the lake we were fishing in, and more. By the time we’d boated 5 fish (4 whites and a largemouth) and missed one more largemouth on the jump, Drew let us know he had enough filmed to make a go of it. So, our jobs done, we headed back to the dock and exchanged farewells. This piece is due to air on Time Warner cable channel 8 (a 24 hour news station) on Sunday, August 1st, and show one time each hour of the day in a 1 1/2 minute segment. All in all, the uniqueness of this experience was very interesting to me and I enjoyed the little extra “pressure” of getting fish in the boat with a purpose other than recreation in mind. We boated 5 fish in ~50 minutes actual fishing time and accomplished what we’d set out to do. After some time off the water to lead our church’s Vacation Bible School last week, I returned to Stillhouse this morning and did the kind of trip I love the most, a father-son trip with a young boy aboard. This morning I was joined by Paul T. and his 5 year old son, Joshua, of Austin. The pair had a rather full summer vacation day planned. That plan included fishing with me in the morning, and taking a “discovery flight” in a small aircraft from the McGregor Airport in the afternoon– very exciting!! Paul and Joshua T. of Austin enjoyed some father and son summertime fun today on Stillhouse!! We had a solid trip today, starting off in deep, open water at Area 644 and to the N and W of it by ~100 yards. We nailed down some locations with abundant bait, found gamefish not too far away and worked ’em over with downriggers until the novelty wore off for little Joshua. We found 22 feet to be the key depth to set the riggers at today, and the larger Pet Spoon in white/white outperformed smaller lures of the same make and color, as well as both sizes of silver lures of the the same make. I suspect the lack of sunlight made the opaque bait stand out a bit better than the shiny finish, and that the shad are growing out now to ~2 inches or so on average. From ~6:45 to ~8:45, we landed every fish we hooked, which included 12 whites, of which 3 were in the 14″ class, and 3 largemouth, the largest of which went 14.75″ and 1.50 lbs. Joshua got really quiet and put his game face on when he had those fish on the line and was very focused until that hooked fish came aboard. As with most 5 year olds, even the fastest action couldn’t keep pace with his attention span beyond the 2 hour mark, and so, with whites and blacks still biting, we left them behind in search of the mighty sunfish for a change of pace. At this point we had nearly windless conditions which made for some great conditions for spotting sunfish with polarized glasses on. We hit Area 231 and found abundant sunfish in the aquatic vegetation here. No reasonably well-placed cast went unanswered, allowing Joshua and Paul to boat 11 sunfish in under 25 minutes, including bluegill, longear, green sunfish, and even a green/bluegill hybrid. Alas, even this lost it’s appeal after a bit for young Joshua, as noted by his dad who observed him playing in the worm container and showing an increased disinterest in battling anymore of the scrappy little “sunnies” that we’d found. At that point dad wisely called it a good day after about 3 hours on the water, and we held onto our hats for a quick boat ride back to the courtesy dock. I’d like to note here that Paul really did things right as far as introducing a child to fishing. Joshua hadn’t fished much before this trip, so, we did things he could excel at and fished for species that offered constant action instead of slugging it out all day for a few outsized fish. Paul didn’t force him to endure beyond his limited attention span nor relegate him to the back of the boat while he tried to fish on his own. He knew his son well enough to know when he’d had enough of a certain tactic and let me know that so I could keep things interested. In short, he focus on Joshua and as a result Joshua did well, was encouraged by his dad, and, I have no doubt, walked away with a favorable impression of the sport which can be expanded on in the future as he matures and can do more complex tasks that require more patience and offer greater reward. Wish more dads “got it” like Paul “gets it”. Our tally for the day came to 26 fish including 12 whites, 3 largemouth, and 11 sunfish. Air Temp: 72F at trip’s start, heading only to the mid-80’s due to rain and heavy cloud cover. Wind: Winds were SE at 2-6 the entire trip. Skies: Skies were low, grey and 100% cloudy. 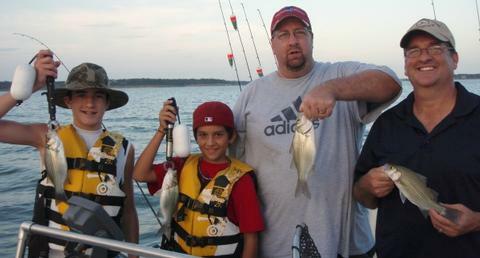 I fished a “Kids Fish, Too!” trip today with father and son Josh and Corrie M. of Killeen. 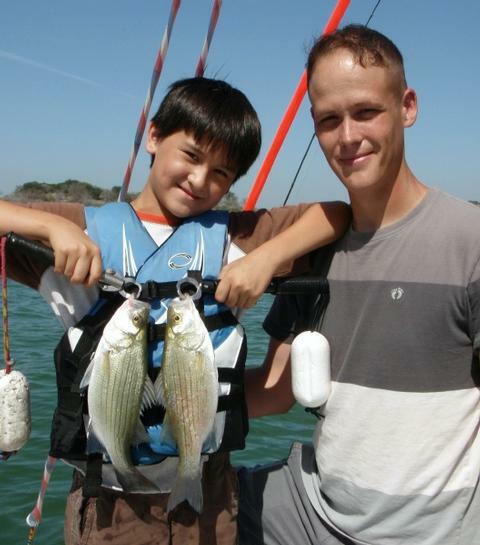 Josh is a non-commissioned officer in the U.S. Army, and Corrie is a bright 10 year old boy who loves fishing! 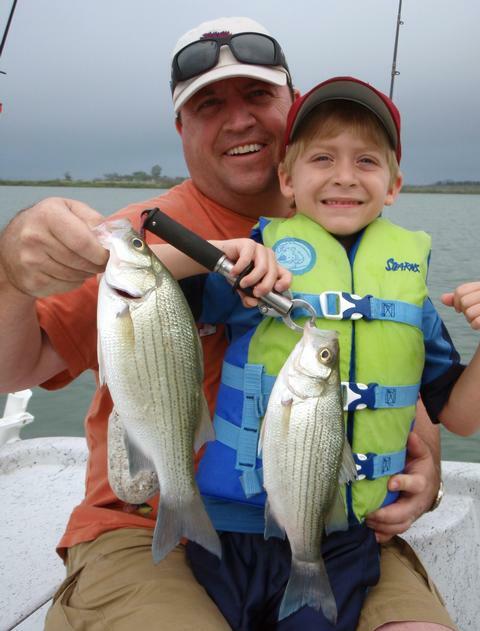 Corrie and his dad, Josh, with a pair of 14+ inch white bass taken on downriggers today. We began our trip looking at first for some topwater action, but none was to be had, so we quickly focused on suspended fish and targeted them with downriggers. We fished 3 areas thoroughly and had good results at two, and just fair results at the third. Our most productive Area was along a circuit extending from Area 196 through Areas 39 and 41 to Area 40. I fished this area yesterday and found it even more productive today due to the presence of more bait. We ran our ‘riggers at 23-27 feet all day today; 23-24 feet was the ticket here. Based on a definite preference the fish showed for the White Willow spoon yesterday, I used twin Willows today and both rods stayed busy. We boated 19 fish at this location before the action died. We then moved on to just N. of Area 644 and fished from here and to the W. by ~200 yards. There was a lot of bait in here, but it was in “blanket” mode and not in a defensive posture indicating the gamefish were not pursuing. We did run across a single large school of white bass, but, even with the balls very well adjusted we failed to hook up. We did land 3 white bass in here, but things just were clicking, so, we moved on. We made our last stop at between Areas 457 to 458. We found fish here just 2-3 feet off bottom in 28 to 34 feet, and tried to keep the downriggers at 26-27 feet. We struggled a bit here at first, going over a lot of fish with relatively few striking. Then, one of the white bass we caught regurgitated a shad that allowed us to see the forage size these fish were keying on. We downsized to the small Pet Spoon on both rods at this point, and, despite the late hour (now past 10am) saw an uptick in our success to finish out the trip. After the bait change, we landed not only white bass, but a largemouth, a drum, and a channel cat which told me everything eating shad in that area was keying on those small baits. We ended our trip with exactly 30 fish landed and ~3-4 more lost as Corrie got the hang of playing and fighting the fish down real well. The two have plans to head to Wisconsin before school begins and try their hand at musky fishing up there. I know Corrie will be up to the challenge! Air Temp: 77F at trip’s start, heading towards the mid-90’s. Wind: Winds were SSW at 4-5 before sunup and increased to SSW10-12 by trip’s end. Skies: Skies were clear and dry under strong high pressure. I fished a morning “Kids Fish, Too!” trip today with Hannah (10 years old) and Logan J. (6 years old) and their mom and dad, Earl and Kristi, all from Claremore, Oklahoma. They were down visiting family and decided to make a family fishing trip part of their summer. 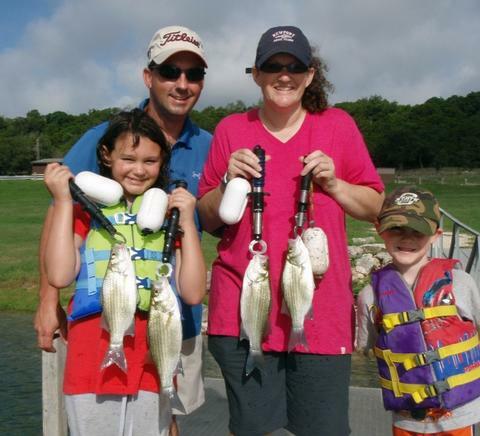 From L to R: Hannah, Earl, Kristi, and Logan with a nice string of white bass. 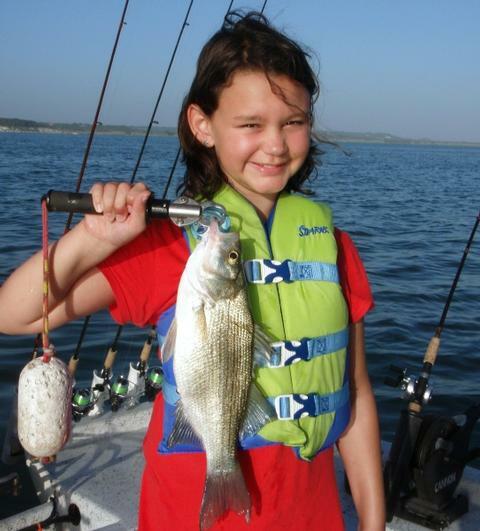 Hannah’s 15 1/8 inch white bass earned her a Texas Parks and Wildlife Big Fish Award!! As always in the summer when the winds are manageable, I did a short listening stop looking for the possibility of some topwater action. Lately, only 1 in 4 or 5 trips has offered any topwater, and we found none today. So, we headed to open water and used sonar to identify several areas holding both baitfish and gamefish, and began to put together a downrigging regimen that worked. As the summer goes on, the baitfish grow — as a result, I tend to use larger and larger baits as the warmwater season progresses. Today was the first trip of the season in which the White Willow (a mid-sized presentation that I make myself) outperformed the smallest Pet Spoon. Our first success came along a circuit extending from Area 196 through Areas 39 and 41 to Area 40. The kids got the lines stripped out to the correct distance behind the boat and set the lines to the correct depth (23-24 foot worked well today) and we went to work. We put 4 whites in the boat right off the bat, then, Hannah’s rod went up indicating that a larger fish had struck her presentation and snatched the line out of the release clip under its own power. We brought the fish to net and found it was a big white bass measuring 15 1/8 inches, thus earning her a TPWD Big Fish certificate for eclipsing the 15 inch mark on that species. We continued working over this area for 6 more fish and gradually ran out of fish in this location. I brought some baitfish to put on downlines for largemouth, but found no largemouth on some of the traditional structures they hang around this time of year and so decided to look elsewhere when, lo and behold, Logan announced that nature was calling. So, we headed back to civilization and I rigged up some quill floats while waiting on shore and had the kids all ready to do some sunfishing at Area 239 when they returned to the boat. Both kids did well at observing the float and had good hook-set timing, thus allowing them to boat 7 sunfish in under 15 minutes. Well, little Logan got tired of that pretty quickly and by now Hannah had those hard-pulling white bass in her blood, so, we returned to the main lake and gave downrigging another try. This time we hit a circuit from Area 457 to 458 as the wind was coming in on this feature real well. We boated 8 more fish here and missed a jumping largemouth. Logan earned the nickname “Little Drummer Boy” as he landed not one, but three drum, the last two coming as a double (2 fish caught at the same time on the same rod) as one drum inhaled a Lunker Licker, and a schoolmate went for the Pet Spoon trailing behind. By 10:30 the action softened very quickly. I did spot a tight school of white bass at a breakline going from 20 to 27 feet and buoyed them, but, when we set up over them using bladebaits, we only got one follow in 10+ minutes of effort. Things got really quiet after this and it was apparent the morning feed was done. As we arrived back at dockside, young Logan took great pleasure in releasing my bait fish back into the wilderness. This was just a great trip with a great family — we enjoyed one another’s company and some good Texas summertime fishing while it lasted. Wind: Winds were S at 6 before sunup and increased to S10-12 by trip’s end. Skies: Skies were clear and dry. 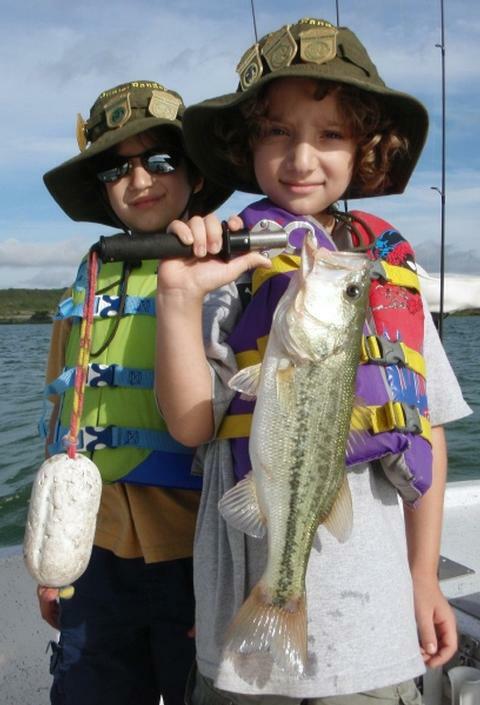 I fished a morning “Kids Fish, Too!” trip with 8 year old twins Gabriel and Alex B. and their dad, Steven, all of Austin. I’ve had literally hundreds of kids aboard my boat over the years, but never a set of twins. These boys were very helpful to one another and displayed a great sense of teamwork that helped up put together a good catch on a tough day! Gabriel stands by with Alex holding this trip’s lunker — a largemouth going just shy of 3 pounds. 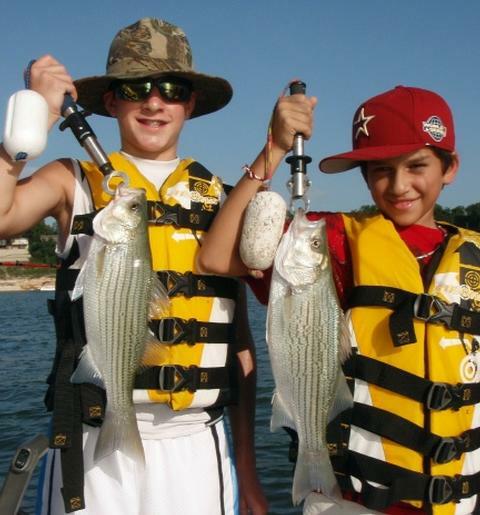 The Brown Boys with our best 4 white bass. The night before the trip I spent some time on the phone with Steven to understand the boys’ past experience and ability level, etc. I came prepared to introduce them to spinning equipment, but also prepared to fall back on closed-faced equipment if need be. The boys did well casting both, but, with the strong winds, we never really used either. After casting lessons, we headed out to Area 061 and did a listening stop, but nothing was afoot (or “afin”). We then started looking deep over Area 481 to Area 517 and marked both bait and gamefish and pulled our first two fish of the day here. Things thinned out over the next 25 minutes or so, so we headed to Area 205 to 444 and failed to find much in the way of bait or gamefish here. We continued the search and finally got into some good bait and gamefish over 30-40 feet of water in a 180 degree, 400 foot arc to the east of Area 644. We worked this area over very thoroughly and in two-plus hours’ time boated exactly 20 fish including 2 drum, 4 largemouth, and 14 white bass. We lost 4 other fish. Our largest fish was a largemouth just shy of the 3 pound mark that Alex tangled with about mid-way into the trip. We fished today with a solo Pet on one rod and a Pet/Licker on the other rod. Not a single fish hit the Licker, and both rods caught evenly on the Pets. By 10:45, with our 20 fish in the boat, the boys perked up at the mention of doing a little bobber fishing (something they’d done a bit of on earlier excursions). We headed to Area 239, used quill rigs to present small baits to bluegill, and boated 3 fish a piece in about 10 minutes. The boys both tried their hand at removing the hook from the fish using the “OK” method, and did really well. By 11:05, it was getting warm, and the boys were ready to call it a day. They both shook my hand and thanked me for a nice trip, and summarized for me all they’d learned in our morning spent together. Air Temp: 78F at trip’s start, heading towards the mid-90’s. Wind: Winds were SSE at 10 before sunup and increased to SSE17 by trip’s end. Skies: Skies were murky and grey until around 9:30 and then began to clear to 50% cloudy with fair skies between. 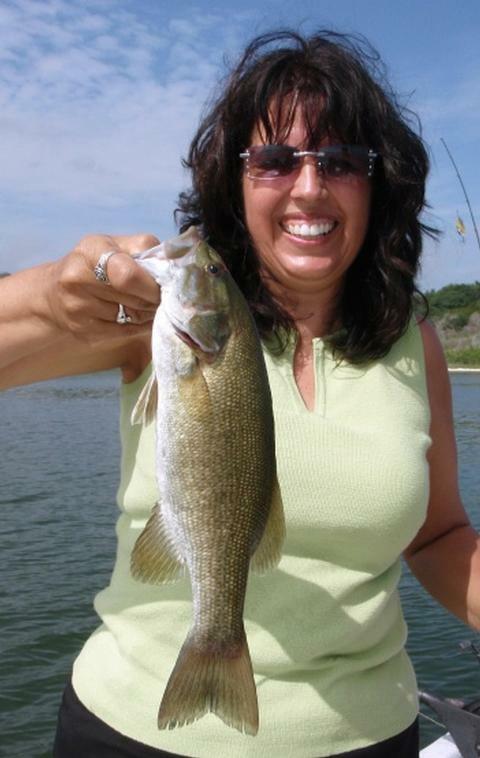 I fished a half-day morning trip today with Shari A. of Leander, and her friend, John, of Little River. This trip was a birthday surprise for John, and, I must say, Shari did a great job in pulling it all off. Shari and John with our largest fish of the day, a 21 3/8 inch hybrid falling just shy of the 5 pound mark taken on a Pet Spoon in deep water. Shari, originally from Canada, had some good tales to tell “about” her dad taking her fishing up north after we caught this one. Nice smallmouth, eh? As we got underway, I was hoping that on the heels of this past Wednesday’s awesome topwater display, that we’d encounter at least a bit of topwater, but that was not to be. Two days of tropical depression-driven rains, an unstable atmosphere and weekend boat pressure put the lid on topwater today. We looked over several areas both visually and with sonar, and finally wetted a line at Area 651. In this area, I saw a bit of bait (less than I’d like, but okay) but a lot of sonar signatures of hybrid striped bass. We put downrigger balls down to 27 feet over a bottom that varied from 30 to 40 feet, and just set up a trolling grid over this area until we saw some consistency in results. We boated 2 hybrid right away and then things calmed down a bit. I noted the wind had let up and the murky skies had cleared a bit, so, with action kind of slow, we went looking once again for some topwate action, but none was to be found, so, we returned to Area 651 and spent the entirety of the trip right there. Upon our return, we began boating fish more regularly with the improved sky and wind conditions. I also noted that the fish showed a definite preference for the single Pet Spoon versus one used in combination behind a Lunker Licker. By the time the fishing began to wane and the heat began to kick in pretty good at 11:45 or so, we’d boated a total of 24 keeper hybrid (and no shorts! 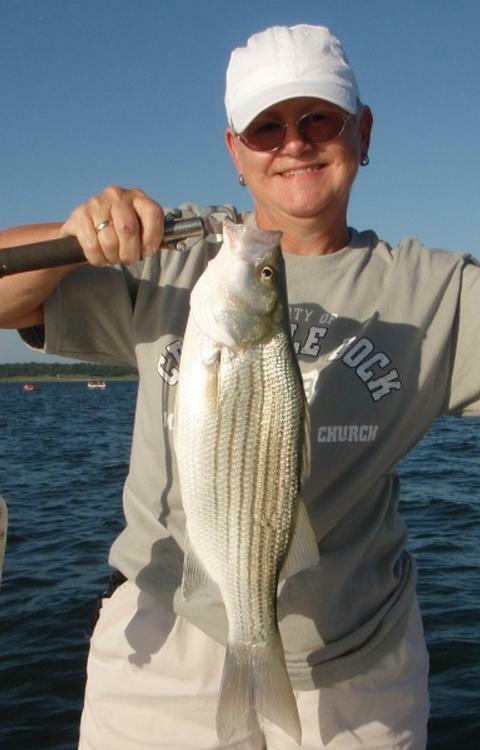 ), 4 white bass, and 1 smallmouth bass. We lost ~4 other hybrid over the course of the morning, as well. Skies: Skies were murky and grey until around 9:30 and then began to clear to 20% high white clouds. As this morning’s trip came to a close, I returned to the ramp, grabbed some groceries out of the truck and returned to the water to do some scouting for fish and bait in advance of the 4:45pm start time for my evening trip. Fishing was really slow during this time from noon to 4pm. I did a lot more looking than fishing, and caught 5 white bass and 1 short hybrid during my efforts. The final white bass however came right at 4:00pm and came from a deep school of scattered fish — a scenario that lends itself well to downrigging. So, armed with “fresh” success, I picked up Mike, Doug, Michael Paul, and Aaron M. at the courtesy dock right at 4:45p and we shot over to the very same spot where I’d seen these white bass. As is typical of summer afternoons, the fishing was a bit slow, but we managed to boat 9 whites and a freshwater drum in about 75 minutes of fishing, all between Areas 305 and 354, and all on small Pet Spoons set right above the depth the suspended fish were frequenting. Cousins Michael Paul (L) and Aaron M. (R) show off the twin hybrid they landed on downrigged Pet Spoons this afternoon. The entire clan (from L to R) Michael Paul, Aaron, Doug, and Michael, lip-grip a sampling of the white bass action that came our way this afternoon. When the whites here had tolerated all of the commotion they could stand, and as the fairly stiff 16 mph SE wind subsided a bit, we headed out and hit Area 651 specifically seeking hybrid. 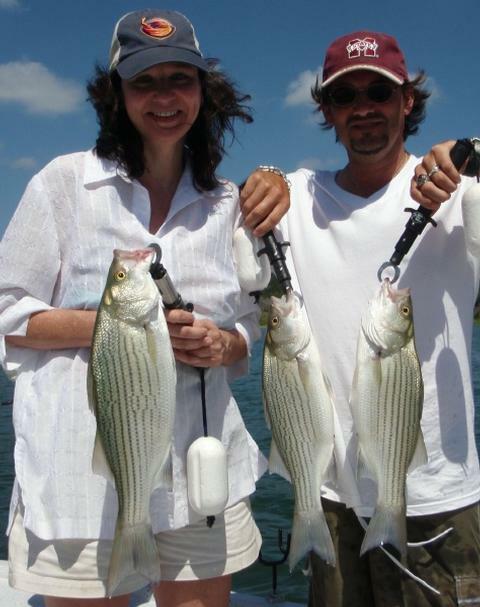 We had baits in the water less than a minute and had our first hybrid on (a keeper), then came a double on keeper hybrid, then a white bass, then a drum, then a channel cat, then things went quiet. 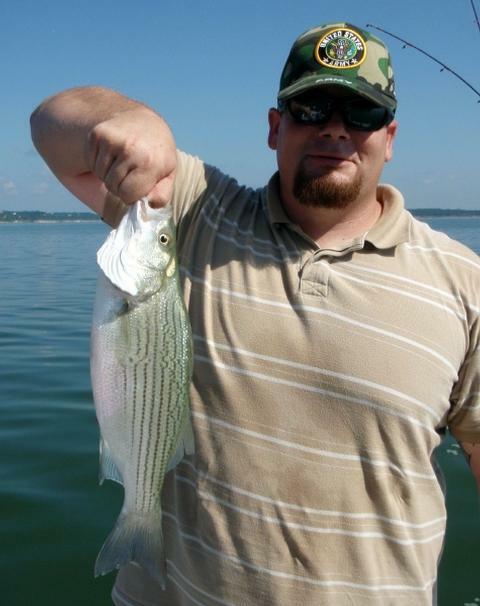 We headed out and worked over Area 473 for 2 white bass, but things were very slow here. We ended up our trip by heading to between Areas 024 and 147 in the 80 minutes prior to dark. We worked this area over with downriggers and put an additional 7 fish in the boat including 6 whites and another keeper hybrid. We found abundant, active fish here on bottom in ~25 feet of water and tried casting bladebaits at them, but the heavy wave action from boats and the still stiff wind here at this very exposed area made boat control difficult for me, and bait control difficult for everyone else. By dark the action was over, and we ended up the day with 25 fish for our efforts. This, plus the 6 fish from my scouting, tallied to 31 fish boated this afternoon. Air Temp: 92F at trip’s start, then cooling a bit towards dark. Skies: Skies were clear with ~20% high white clouds. I fished a half-day morning trip with Dave and Jamie S. of Salado today. Dave is a defense contractor and just returned home from Afghanistan, and Jamie teaches performing arts in our local school district. We were originally scheduled to fish at Stillhouse, but, after doing a scouting trip of just 2 hours on Belton last night, I had a feeling things were going to be good today. This “hunch” was due to the fact that I saw a lot of fish on sonar poised to come shallow and feed right around sunset, but, just about the time the feed should have kicked in, a rainshower hit, dropping over a 1/4 inch of rain over a 25 minutes span and took the winds from calm to around 12 mph from the E. Long story short, the fish went to bed without supper, so to speak, which can make for some great morning fishing. Jamie landed this nice hybrid on a Pet Spoon worked down at 24 feet over a 40 foot bottom. Dave with 1 of the the 199 fish we boated today in what was the strongest topwater action I’ve seen on Belton in a long time. This one blasted a bladebait. We got on the water at 6:20, and headed to Area 012. No sooner did I cut the outboard and drift to a stop, then we sighted the first topwater action of the day about 80 yards to the E. of us. We got into those fish with bladebaits and by the time the last fish sounded Dave and Jamie had boated 31 fish consisting of a mix of white bass and small hybrid. We lift-dropped blades poking around for bottom-oriented and suspended fish, but to no avail. We next moved to between Areas 487 and 488 and downrigged with one Pet/Licker combo and one solo Pet. Our first hookup came rather quickly — a nice, keeper hybrid displayed by Jamie in the photo above. We landed 3 white bass in this area as well and then continued the hunt. At this point Jamie had to depart, but Dave and I stuck with it as he was anxious to learn and was doing one of the things he’d dreamed about doing while overseas. We searched a few areas with sonar, but didn’t find much until I caught a glimpse of some topwater action in the distance while scanning with my spotting scope. We zipped over to Area 478 and were pleased to find the fish going nowhere in a hurry. We fished over these topwater feeding fish for just shy of an hour and took our tally from 35 fish to 95 fish over this span of time. By the time the action had ended, it was still, bright, hot, and humid, but Dave was determined that we could boat just 5 more fish to make it an even 100 for the day, so, given it was now only about 10:30, we continued the search. I took us over to Area 512 and, as we approached, I saw a single, small school of white crop up and then sound very quickly. We hung in the area, as some heavy clouds were now beginning to build in the SE. We waited about 10 minutes, and no sooner did the first cloud obscure the sun, then the fish just went ballistic. There were literally several acres of fish feeding hard on shad ranging from ~1 1/8 inches up to 3+ inches from here over to Area 154. We stayed hard after these fish for a solid hour, and took our tally from 95 fish up to 199 fish. As the clouds began to thicken, it began to sprinkle, then downpour, then a light ESE breeze began. The fish continued feeding as the rain began and after it intensified, but once the breeze began, they were done for good. We ended our trip — my most productive trip of the year thus far — with 199 fish, all of which were white bass and hybrid striped bass. Wind: Winds were light and variable the entire trip, until rainshower induced light E. winds began around 11:20.